Looking for IBM Infoprint 1854 Parts? For ordering, contact your InfoPrint Solutions Company representative or InfoPrint Solutions Company Business Partner. All models include one 550-sheet drawer, and a 100-sheet multipurpose feeder (MPF). Optional 550-sheet drawers and a 2,000-sheet drawer are available. Maximum input capacity is 4,300 sheets. Output capacity for all models is 300 sheets. 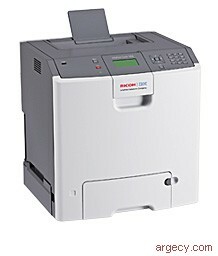 This printer is the replacement for the InfoPrint Color 1754. The 4977 InfoPrint Color 1854 Model N01 has 256 MB standard memory, 1280 MB maximum memory, USB port standard, 900 MHz processor, no duplex, and 100BaseTx. The 4977 InfoPrint Color 1854 Model DN1 has 256 MB standard memory, 1280 MB maximum memory, USB port standard, 900 MHz processor, duplex standard, and 100BaseTx. The maximum monthly usage for the InfoPrint Color 1854 is 85,000 impressions. InfoPrint Solutions Company does not recommend printing to the monthly maximum on a consistent basis. InfoPrint Color 1854 has five Toner Darkness levels for color and monochrome. The default setting is level 4. When printing in color, level 5 is equal to level 4. Refer to the table below. Included on the CD-ROM shipped with the printer are screen fonts to match the printer's resident scalable fonts. The CD-ROM also includes downloadable fonts for Hebrew and Arabic. Note: (1) Heavy media and narrow media begin at the listed throughput, and then throughput is reduced for extended runs. Note: (2) Narrow media throughput depends on media length. Representative throughputs are shown. Cold Start (a,b)                  18.0 sec. Note: (a) All times are measured for 4800CQ simplex printing on letter sized paper. The test job consists of the a simple text page (single page job). The TTFP time is defined as the elapsed time from hitting enter on the PC keyboard to the page exiting to the output bin. All tests pick paper from tray 1. Note: The TTFP from Ready is tested at a 5 minute interval. TTFP from Standby is tested 20 minutes into Power Saver mode. TTFP from Cold start is tested one hour into Power Saver mode. Times will vary at different test intervals. Note: (b) Time to first page may be longer if an automatic calibration is required. The InfoPrint Color 1854 printable area is limited to within 4.2 mm (0.167 in.) of top, bottom, left or right edges of the media. Any information placed outside this specified printable area will not print. The printer comes standard with one 550-sheet paper drawer and a 100-sheet multipurpose feeder (MPF). Up to four optional 550-sheet drawers can be installed or up to three optional 550-sheet drawers and one optional 2000-sheet drawer can be installed. A 300-sheet output bin is standard. See table below for standard and maximum media capacities. Note: The ouput bin capacity may be reduced by up to 50 sheets when the duplex feature is in use. Note: (6) Paper labels supported for occasional use only. Preprinted forms and letterheads must be able to withstand 190 deg C (374 deg F) fusing temperature and should be selected using guidelines found in the printer User's Guide. The chemical process used in preprinting may render some papers unsuitable for use with this printer. The printer has three unique modes of automatic calibration defined. When the engine default resolution is 4800CQ and a triggering event occurs, a "Quick Calibration" is asserted, which includes Auto Alignment and 600 dpi calibration. Conversely, when the engine default resolution is 1200 dpi, a "Full Calibration" is asserted, which includes Auto Alignment, 600 dpi calibration, and 1200 dpi linearization. Additionally, in certain scenarios, a unique "1200 dpi Linearization Only" calibration is performed. Calibration can be manually initiated by selecting "Color Adjust" from the Quality Menu. In Black Only Mode auto calibration is automatically disabled. The printer will automatically retract color cartridges for black only printing with an algorithm based on the color content of the pages. This algorithm may be disabled by setting the printer usage to maximum speed. The color cartridges will also be retracted if black only printing is selected for an entire print job. These are a means of controlling color vs. black only printing. This is a printer based operation that is invoked from the configuration menu (requires POR). The user manually removes color cartridges and photo conductor units, and sets the printer to color lockout mode. This is a printer based operation that is invoked from the Setup menu. This mode is similar to the color lockout mode but does not require the removal of color supplies. Any color content is converted to black only. This is a printer based operation that is invoked from the Quality menu. If the input job from a printer driver does not select Color or Black and White printing, this printer default is used. This could include some legacy applications that generate color PCL. This is similar to sRGB display except that the neutral axis uses Black toner only. InfoPrint Color 1854 offers a Color Balance Control. It is a color correction option that allows the user to increase or decrease the amount of toner going to the page individually for the cyan, magenta, yellow and black color planes. The scale for the adjustments is +5 to -5. An RGB Hue Color Adjustment is selectable in a similar fashion to color balance. InfoPrint Color 1854 will offer a ColorSaver Mode that allows end users to print images and graphics lighter. Text will print at Toner Darkness "4", while images and graphics print at Toner Darkness "1". The ColorSaver Mode is located on the Op panel under the Quality Menu. The ColorSaver feature is available in PostScript, PCL/XL, PCL 5c, PDF, and XPS jobs. The Coverage Estimator is intended to only estimate the coverage on a given job. For all toner colors that are used, the minimum percentage reported will be two percent. Reported values may vary from printer to printer. The accuracy of the estimates may be affected by the fullness of the print cartridges, environmental conditions, media type, application, application settings, driver, driver settings, and the content of the page. InfoPrint Solutions Company makes no claim as to the accuracy of the estimated percents. The fonts in the PCL emulation are compatible with the fonts in the HP Color LaserJet 5550 and include nine additional fonts and many extra symbol sets to support extra languages and applications. Included in the PCL emulation are OCR-A, OCR-B and Code 3 of 9 barcode fonts. The fonts in the PostScript emulation are compatible with 89 of the fonts in Adobe PostScript 3 and include 2 additional Multimaster fonts for printing PDF documents. Additional fonts can be downloaded to the printer RAM, optional User Flash Daughter card, or Hard Disk. The PCL emulation supports both scalable and bitmapped downloadable fonts. The PostScript emulation supports only downloadable scalable fonts. The PPDS emulation supports only downloadable bitmapped fonts. Included on the CD-ROM shipped with the printer are screen fonts to match the printer's resident scalable fonts. The CD-ROM also includes downloadable fonts for Hebrew, and Arabic. There are 88 symbol sets in the PCL emulation to support all the languages that use these characters. All fonts do not necessarily support all symbol sets. Support for the euro currency character is included in all applicable fonts for all emulations. The printer supports Unicode printing with special UTF-8 encodings in both the PCL and PostScript emulations. UTF-8 encoding is a particular way to access characters that is very useful for fonts with large character sets. UTF-8 is used by our SAP printing solution. The display is 160x64 pixel all points addressable (APA) with gray scale capability. Double byte characters are 16x16 pixels in size and the display supports four lines of 10 characters per line maximum. Non-double byte languages use a proportional font so the number of characters per line will vary. The Op Panel can be tilted to adjust the viewing angle (up to 25 degree angle), and it has numeric keypad, backlight and USB 2.0 high speed and full speed flash drive support. The printer supports Sony, SanDisk (Cruzer, Micro) and Lexar (Firefly) USB flash drives in 512 MB and 1 GB sizes. Additional information is provided for a select group of user interventions via a "Tell me more" selection. "Tell me more" selections contain more detail about the specific intervention, such as why it has occurred and/or what the user can do to clear the intervention. Note: Energy star certification requires duplex. The InfoPrint Solutions Company Script Install utility provides a very powerful method to install or uninstall printer software in Windows 2000, Windows XP, Windows Server 2003 environments, and Windows Vista. Through the use of the Script Install utility, System Administrators can easily perform mass rollouts of IBM printers by creating custom scripts to perform local or remote printer software installations on end user workstations. When combined with the Driver Profiler utility, I/T shops can centrally create and deploy custom printing environments for each remote location. Together, these utilities drastically reduce the time required to install printer software in a distributed environment. To maximize the user experience, InfoPrint Solutions Company offers system PCL emulation and PostScript drivers for Windows 2000, XP, Server 2003, and Vista platforms. System drivers for Windows provide the most comprehensive set of printing features available for InfoPrint Solutions Company products. Offering an easy-to-use interface and time saving preset features, the InfoPrint Solutions Company system drivers allow users to access popular printer features intuitively. Universal drivers for Windows provide users with basic printing capabilities for their InfoPrint Solutions Company printers. InfoPrint Solutions Company printer drivers reduce the complications of printing in UNIX and Linux environments. The InfoPrint Solutions Company printer drivers provide fully scriptable command-line options. When running in X-Windows mode, the printer drivers make it easy to access many popular printer features without memorizing command line options through a GUI interface. This printer contains several standard and optional features and functions that improve or enhance the security of the device. Using the latest version of MarkVision Professional, administrators can configure and manage the printer securely by using authenticated and encrypted network communications. The MarkVision Professional plug-in for InfoPrint Color 1854 support must also be downloaded and installed. The printer contains support for several network protocols that increase the security of network communications. When a hard disk is installed in the printer, the user has the option of locking the print device with a user defined PIN and preventing it from printing submitted jobs. All submitted print jobs will be stored on the internal hard drive until the printer is unlocked with the correct PIN. This feature will be especially useful in preventing printing after normal business hours. This feature is setup through the printer's embedded web server and is enabled from the printer's operator panel. It is not supported through MarkVision Professional. Debian GNU/Linux 4.0, Debian GNU/Linux "Lenny"
This additional drawer fits under the standard drawer and increases the printer's input capacity by approximately 550 sheets of (20 lb.) paper. This additional drawer fits under the standard drawer and increases the printer's input capacity by approximately 2,000 sheets of (20 lb.) paper. The InfoPrint Color 1854 has one slot for memory DIMMs and one slot for flash memory cards. Download DBCS outline and bitmap fonts from the host in IPDS. The IPDS emulation supports the IPDS data and resource towers. Fonts can be downloaded, captured and saved to an optional flash memory or optional hard disk in the printer. The US Postal Service (USPS) POSTNET bar code, USPS PLANET bar code, USPS Intelligent Mail Bar Code, and the euro currency symbol are supported within IPDS. The euro currency symbol is also supported in the SCS/TNe, PostScript and PCL 6 emulations. (R), (TM), * Trademark or registered trademark of International Business Machines Corporation. ** Company, product, or service name may be a trademark or service mark of others. InfoPrint is a trademark of InfoPrint Solutions Company LLC in the United States, other countries, or both. Windows is a trademark of Microsoft Corporation. UNIX is a registered trademark in the United States and other countries licensed exclusively through X/Open Company Limited. IBM Corporation 2009.